Cancer is caused by the body's own cells, which change and start growing out of control. With bowel cancer, this affects the cells of the intestinal mucosa. The starting point are mutations, i.e. changes in the genetic information (DNA) of the intestinal stem cells. Their task is to regularly renew the cells of the intestinal mucosa. Intestinal stem cells must retain their ability to divide for their entire lifetime, and are thus particularly susceptible to mutations. To protect against DNA damage, they have specialised repair mechanisms, which immediately correct errors during cell division. By far the most common cause of DNA damage is the incorrect inclusion of an RNA block instead of the correct DNA block. This error, which occurs millions of times, is normally repaired by the enzyme RNase H2b, whose protective function has been known for some time. However, it was unclear to date whether a malfunction of the repair enzyme favours the onset of cancer. Evidence of this has now been found in a study published in Gastroenterology by a team led by cluster board member Professor Philip Rosenstiel and Dr Konrad Aden from the Institute of Clinical Molecular Biology (IKMB) at Kiel University and the Department of Internal Medicine I at the UKSH Kiel. 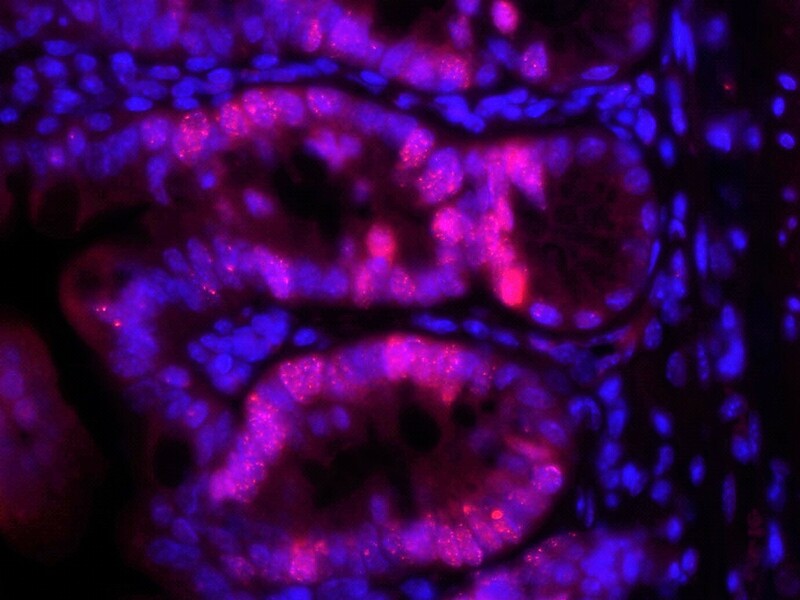 In a mouse model, they have discovered a new mechanism for the development of bowel cancer. There are several indications that this discovery is also relevant for cancer in humans. The focus of the study was the key enzyme of RNA/DNA repair, RNase H2b. This enzyme is particularly active when cells reproduce quickly, i.e. proliferate, for example in the healing phase after injuries or inflammations. In order to investigate the role of the enzyme in the context of the development of cancer, the RNase H2b in cells of the intestinal mucosa of mice were genetically switched off, and the consequences of this intervention analysed after a year. The animals developed spontaneous DNA damage in the intestinal epithelium. As a molecular response to the DNA damage, stem cell drastically reduced their proliferative activity. "Without this repair mechanism, the stem cells stopped their cell division almost completely, as if they wanted to protect against producing further DNA damage," said first author Dr Konrad Aden. Further genetic analyses showed that the function of RNase H2b depends on tumor suppressor gene p53 gene. If this gene is also turned off in the animals, then there is an opposite effect. The intestinal stem cells start dividing in an uncontrolled manner. All 20 animals examined developed spontaneous bowel cancer, without further exogenic stimuli. Applying innovative sequencing methods, carried out in the newly-established Competence Centre for Genome Analysis Kiel (CCGA Kiel), the damage to the genetic material could be characterised in detail. "Our results indicate that the cutting out of RNA blocks is an essential mechanism to protect the genetic material against DNA damage. The absence of this mechanism leaves a mutational signature, similar to a fingerprint, in the modified letter sequence, as also occurs in human tumours," explained Professor Philip Rosenstiel, spokesperson of the CCGA and director at the IKMB. Two further findings of the working group imply that the newly-discovered mechanism could also be relevant for the development of cancer in humans: 1. Mutations of the RNase H2b gene, which have been identified in people with bowel cancer, go hand in hand with a reduced repair capacity. 2. A low RNase H2b gene expression, i.e. a low activity of the gene, is associated with a shortened lifespan in bowel cancer patients. "This study shows for the first time that the disturbed removal of incorrectly-inserted RNA blocks from the genetic material is a previously-unknown mechanism for the development of bowel cancer. It must now be determined whether these findings can be used for the prevention or treatment of the disease," emphasised cluster spokesperson Professor Stefan Schreiber, Director of the Department of Internal Medicine I UKSH Kiel. The Cluster of Excellence "Precision Medicine in Chronic Inflammation" (PMI) has won funding from 2019 to 2025 through the German Excellence Strategy. It succeeds the "Inflammation at Interfaces” Cluster, which had already won funding in two periods of the Excellence Initiative (2007-2018). Around 300 scientists are involved at five locations: Kiel (Kiel University, University Medical Center Schleswig-Holstein (UKSH), Muthesius University), Lübeck (University of Lübeck, UKSH), Plön (Max Planck Institute for Evolutionary Biology), Borstel (Research Center Borstel - Leibniz Lung Center) and Großhansdorf (Lungenclinic Grosshansdorf). The aim is to draw on the multifaceted research approach to chronic inflammatory diseases of barrier organs, and transfer this interdisciplinarity to healthcare and to promote the fulfilment of previously unmet needs of patients. Three points are important in the context of a successful treatment, and are therefore at the centre of the PMI research: the early detection of chronic inflammatory diseases, the prediction of disease progression and complications, and the prediction of the individual response to treatment. Cluster of Excellence "Precision Medicine in Chronic Inflammation"